The “apostle of the north” (Scandinavia) had enough frustrations to become a saint—and he did. He became a Benedictine at Corbie, France, where he had been educated. Three years later, when the king of Denmark became a convert, Ansgar went to that country for three years of missionary work, without noticeable success. Sweden asked for Christian missionaries, and he went there, suffering capture by pirates and other hardships on the way. Less than two years later he was recalled, to become abbot of New Corbie (Corvey) and bishop of Hamburg. The pope made him legate for the Scandinavian missions. Funds for the northern apostolate stopped with Emperor Louis’s death. After 13 years’ work in Hamburg, Ansgar saw it burned to the ground by invading Northmen; Sweden and Denmark returned to paganism. He directed new apostolic activities in the North, traveling to Denmark and being instrumental in the conversion of another king. By the strange device of casting lots, the king of Sweden allowed the Christian missionaries to return. Ansgar’s biographers remark that he was an extraordinary preacher, a humble and ascetical priest. He was devoted to the poor and the sick, imitating the Lord in washing their feet and waiting on them at table. 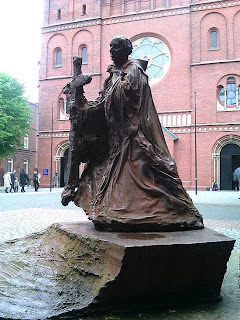 He died peacefully at Bremen, Germany, without achieving his wish to be a martyr. Today is the Feast Day of our own Fr. Oscar, O. de M., whose patron is St. Ansgar. May his intercession continue to guide Fr. Oscar to holiness and peace.